This article elaborates on the central technology of generating nuclear power. Core of CROCUS, a small nuclear reactor used for research at the EPFL in Switzerland. A nuclear reactor is a device in which nuclear chain reactions are initiated, controlled, and sustained at a steady rate, as opposed to a nuclear bomb, in which the chain reaction occurs in a fraction of a second and is uncontrolled causing an explosion. The most significant use of nuclear reactors is as an energy source for the generation of electrical power (see Nuclear power) and for the power in some ships (see Nuclear marine propulsion). This is usually accomplished by methods that involve using heat from the nuclear reaction to power steam turbines. There are also other less common uses as discussed below. An induced nuclear fission event. A neutron is absorbed by the nucleus of a uranium-235 atom, which in turn splits into fast-moving lighter elements (fission products) and free neutrons. The physics of operating a nuclear reactor are explained in Nuclear reactor physics. Just as many conventional thermal power stations generate electricity by harnessing the thermal energy released from burning fossil fuels, nuclear power plants convert the thermal energy released from nuclear fission. The reactor is used to convert atomic energy into heat. While a reactor could be one in which heat is produced by fusion or radioactive decay, this description focuses on the basic principles of the fission reactor. When a relatively large fissile atomic nucleus (usually uranium-235 or plutonium-239) absorbs a neutron it is likely to undergo nuclear fission. The atom splits into two or more smaller nuclei with kinetic energy (known as fission products) and also releases gamma radiation and free neutrons. A portion of these neutrons may later be absorbed by other fissile atoms and create more fissions, which release more neutrons, and so on. The nuclear chain reaction can be controlled by using neutron poisons and neutron moderators to change the portion of neutrons that will go on to cause more fissions. *  Increasing or decreasing the rate of fission will also increase or decrease the energy output of the reactor. A cooling source—often water but sometimes a liquid metal—is circulated past the reactor core to absorb the heat that it generates. The heat is carried away from the reactor and is then used to generate steam. Most reactor systems employ a cooling system that is physically separate from the water that will be boiled to produce pressurized steam for the turbines, but in some reactors the water for the steam turbines is boiled directly by the reactor core. The power output of the reactor is controlled by controlling how many neutrons are able to create more fissions. Control rods that are made of a nuclear poison are used to absorb neutrons. Absorbing more neutrons in a control rod means that there are fewer neutrons available to cause fission, so pushing the control rod deeper into the reactor will reduce it's power output, and extracting the control rod will increase it. In some reactors, the coolant also acts as a neutron moderator. A moderator increases the power of the reactor by causing the fast neutrons that are released from fission to lose energy and become thermal neutrons. Thermal neutrons are more likely than fast neutrons to cause fission, so more neutron moderation means more power output from the reactors. If the coolant is a moderator, then temperature changes can affect the density of the coolant/moderator and therefore change power output. A higher temperature coolant would be less dense, and therefore a less effective moderator. In other reactors the coolant acts as a poison by absorbing neutrons in the same way that the control rods do. In these reactors power output can be increased by heating the coolant, which makes it a less dense poison. Nuclear reactors generally have automatic and manual systems to insert large amounts of poison into the reactor to shut the fission reaction down if unsafe conditions are detected. The energy released in the fission process generates heat, some of which can be converted into usable energy. A common method of harnessing this thermal energy is to use it to boil water to produce pressurized steam which will then drive a steam turbine that generates electricity. Nuclear power plants typically employ just under a thousand people per reactor (including security guards and engineers associated with the plant but working elsewhere). In the United States and Canada, all non-management and non-security workers are members of the International Brotherhood of Electrical Workers. NC State's PULSTAR Reactor is a 1 MW pool-type research reactor with 4 percent enriched, pin-type fuel consisting of UO2 pellets in zircaloy cladding. Thermal reactors use slow or thermal neutrons. Most power reactors are of this type. These are characterized by neutron moderator materials that slow neutrons until they approach the average kinetic energy of the surrounding particles, that is, until they are thermalized. Thermal neutrons have a far higher probability of fissioning uranium-235, and a lower probability of capture by uranium-238 than the faster neutrons that result from fission. As well as the moderator, thermal reactors have fuel (fissionable material), containments, pressure vessels, shielding, and instrumentation to monitor and control the reactor's systems. Fast neutron reactors use fast neutrons to sustain the fission chain reaction. They are characterized by an absence of moderating material. 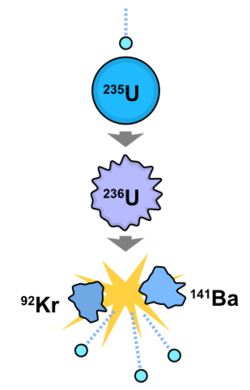 Initiating the chain reaction requires enriched uranium (and/or enrichment with plutonium 239), due to the lower probability of fissioning U-235, and a higher probability of capture by U-238 (as compared to a moderated, thermal neutron). Fast reactors have the potential to produce less transuranic waste because all actinides are fissionable with fast neutrons, but they are more difficult to build and more expensive to operate. Overall, fast reactors are less common than thermal reactors in most applications. Some early power stations were fast reactors, as are some Russian naval propulsion units. Construction of prototypes is continuing (see fast breeder or generation IV reactors). Nuclear fusion. Fusion power is an experimental technology, generally with hydrogen as fuel. While not currently suitable for power production, Farnsworth-Hirsch fusors are used to produce neutron radiation. Radioactive decay. Examples include radioisotope thermoelectric generators and atomic batteries, which generate heat and power by exploiting passive radioactive decay. Light water moderated reactors (LWRs). Light water reactors use ordinary water to moderate and cool the reactors. When at operating temperatures if the temperature of the water increases, its density drops, and fewer neutrons passing through it are slowed enough to trigger further reactions. That negative feedback stabilizes the reaction rate. Graphite and heavy water reactors tend to be more thoroughly thermalized than light water reactors. Due to the extra thermalization, these types can use natural uranium/unenriched fuel. Light element moderated reactors. These reactors are moderated by lithium or beryllium. Molten salt reactors (MSRs) are moderated by a light elements such as lithium or beryllium, which are constituents of the coolant/fuel matrix salts LiF and BeF2. Liquid metal cooled reactors, such as one whose coolant in a mixture of Lead and Bismuth, may use BeO as a moderator. Pressurized channels. Channel-type reactors can be refueled under load. BWRs are characterized by boiling water around the fuel rods in the lower portion of primary reactor pressure vessel. During normal operation, pressure control is accomplished by controlling the amount of steam flowing from the reactor pressure vessel to the turbine. Gas cooled reactors are cooled by a circulating inert gas, usually helium. Nitrogen and carbon dioxide have also been used. Utilization of the heat varies, depending on the reactor. Some reactors run hot enough that the gas can directly power a gas turbine. Older designs usually run the gas through a heat exchanger to make steam for a steam turbine. Molten Salt Reactors (MSRs) are cooled by circulating a molten salt, typically a eutectic mixture of fluoride salts, such as LiF and BeF2. In a typical MSR, the coolant is also used a matrix in which the fissile material is dissolved. The "Gen IV"-term was dubbed by the DOE for developing new plant types in 2000. In 2003, the French CEA was the first to refer to Gen II types in Nucleonics Week; "Etienne Pochon, CEA director of nuclear industry support, outlined EPR's improved performance and enhanced safety features compared to the advanced Generation II designs on which it was based." First mentioning of Gen III was also in 2000 in conjunction with the launch of the GIF plans. Breeder reactors. Fast breeder reactors are capable of enriching Uranium during the fission chain reaction (by converting fertile U-238 to Pu-239) which allows an operational fast reactor to generate more fissile material than it consumes. Thus, a breeder reactor, once running, can be re-fueled with natural or even depleted uranium. Providing a source of neutron radiation (for example with the pulsed Godiva device) and positron radiation) (for example, neutron activation analysis and potassium-argon dating. These systems produces heat through passive radioactive decay. Some radioisotope thermoelectric generators have been created to power space probes (for example, the Cassini probe), some lighthouses in the former Soviet Union, and some pacemakers. The heat output of these generators diminishes with time; the heat is converted to electricity utilizing the thermoelectric effect. The nuclear fission reactor produces heat through a controlled nuclear chain reaction in a critical mass of fissile material. All current nuclear power plants are critical fission reactors, which are the focus of this article. The output of fission reactors is controllable. There are several subtypes of critical fission reactors, which can be classified as Generation I, Generation II and Generation III. All reactors will be compared to the Pressurized Water Reactor (PWR), as that is the standard modern reactor design. These reactors use a pressure vessel to contain the nuclear fuel, control rods, moderator, and coolant. They are cooled and moderated by high pressure liquid water. The hot radioactive water that leaves the pressure vessel is looped through a steam generator, which in turn heats a secondary (non-radioactive) loop of water to steam that can run turbines. They are the majority of current reactors, and are generally considered the safest and most reliable technology currently in large scale deployment. This is a thermal neutron reactor design, the newest of which are the Advanced Pressurized Water Reactor and the European Pressurized Reactor. United States Naval reactors are of this type. A Canadian design, (known as CANDU) these reactors are heavy-water-cooled and -moderated Pressurized-Water reactors. Instead of using a single large pressure vessel as in a PWR, the fuel is contained in hundreds of pressure tubes. These reactors are fueled with natural uranium and are thermal neutron reactor designs. PHWRs can be refueled while at full power, which makes them very efficient in their use of uranium (it allows for precise flux control in the core). CANDU PHWR's have been built in Canada, Argentina, China, India (pre-NPT), Pakistan (pre-NPT), Romania, and South Korea. India also operates a number of PHWR's, often termed 'CANDU-derivatives', built after the Government of Canada halted nuclear dealings with India following the 1974 Smiling Buddha nuclear weapon test. A Soviet Union design, built to produce plutonium as well as power. RBMKs are water cooled with a graphite moderator. RBMKs are in some respects similar to CANDU in that they are refuelable during power operation and employ a pressure tube design instead of a PWR-style pressure vessel. However, unlike CANDU they are very unstable and too large to have containment buildings, making them dangerous in the case of an accident. A series of critical safety flaws have also been identified with the RBMK design, though some of these were corrected following the Chernobyl accident. RBMK reactors are generally considered one of the most dangerous reactor designs in use. The Chernobyl plant had four RBMK reactors. These are generally graphite moderated and CO2 cooled. They can have a high thermal efficiency compared with PWRs due to higher operating temperatures. There are a number of operating reactors of this design, mostly in the United Kingdom, where the concept was developed. Older designs (that is, Magnox stations) are either shut down or will be in the near future. However, the AGCRs have an anticipated life of a further 10 to 20 years. This is a thermal neutron reactor design. Decommissioning costs can be high due to large volume of reactor core. Most LMFBRs are of this type. The sodium is relatively easy to obtain and work with, and it also manages to actually prevent corrosion on the various reactor parts immersed in it. However, sodium explodes violently when exposed to water, so care must be taken, but such explosions wouldn't be vastly more violent than (for example) a leak of superheated fluid from a SCWR or PWR. EBR-I, the first reactor to have a core meltdown, was of this type. More than a dozen advanced reactor designs are in various stages of development. Some are evolutionary from the PWR, BWR and PHWR designs above, some are more radical departures. The former include the Advanced Boiling Water Reactor (ABWR), two of which are now operating with others under construction, and the planned passively safe ESBWR and AP1000 units (see Nuclear Power 2010 Program). The Integral Fast Reactor was built, tested and evaluated during the 1980s and then retired under the Clinton administration in the 1990s due to nuclear non-proliferation policies of the administration. Recycling spent fuel is the core of its design and it therefore produces only a fraction of the waste of current reactors. The Pebble Bed Reactor, a High Temperature Gas Cooled Reactor (HTGCR), is designed so high temperatures reduce power output by doppler broadening of the fuel's neutron cross-section. It uses ceramic fuels so its safe operating temperatures exceed the power-reduction temperature range. Most designs are cooled by inert helium. Helium is not subject to steam explosions, resists neutron absorption leading to radioactivity, and does not dissolve contaminants that can become radioactive. Typical designs have more layers (up to 7) of passive containment than light water reactors (usually 3). A unique feature that may aid safety is that the fuel-balls actually form the core's mechanism, and are replaced one-by-one as they age. The design of the fuel makes fuel reprocessing expensive. SSTAR, Small, Sealed, Transportable, Autonomous Reactor is being primarily researched and developed in the U.S., intended as a fast breeder reactor that is passively safe and could be remotely shut down in case the suspicion arises that it is being tampered with. The Clean And Environmentally Safe Advanced Reactor (CAESAR) is a nuclear reactor concept that uses steam as a moderator—this design is still in development. Thorium based reactors. It is possible to convert Thorium-232 into U-233 in reactors specially designed for the purpose. In this way, Thorium, which is more plentiful than uranium, can be used to breed U-233 nuclear fuel. U-233 is also believed to have favorable nuclear properties as compared to traditionally used U-235, including better neutron economy and lower production of long lived transuranic waste. Advanced Heavy Water Reactor—A proposed heavy water moderated nuclear power reactor that will be the next generation design of the PHWR type. Under development in the Bhabha Atomic Research Centre (BARC). KAMINI—A unique reactor using Uranium-233 isotope for fuel. Built by BARC and IGCAR Uses thorium. Designs which are theoretically possible, but which are not being actively considered or researched at present. Though such reactors could be built with current or near term technology, they trigger little interest for reasons of economics, practicality, or safety. Liquid Core reactor. 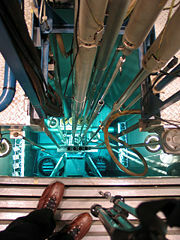 A closed loop liquid core nuclear reactor, where the fissile material is molten uranium cooled by a working gas pumped in through holes in the base of the containment vessel. Gas core reactor. A closed loop version of the nuclear lightbulb rocket, where the fissile material is gaseous uranium-hexafluoride contained in a fused silica vessel. A working gas (such as hydrogen) would flow around this vessel and absorb the UV light produced by the reaction. In theory, using UF6 as a working fuel directly (rather than as a stage to one, as is done now) would mean lower processing costs, and very small reactors. In practice, running a reactor at such high power densities would probably produce unmanageable neutron flux. Gas core EM reactor. As in the Gas Core reactor, but with photovoltaic arrays converting the UV light directly to electricity. Controlled nuclear fusion could in principle be used in fusion power plants to produce power without the complexities of handling actinides, but significant scientific and technical obstacles remain. Several fusion reactors have been built, but as yet none has "produced" more thermal energy than electrical energy consumed. Despite research having started in the 1950s, no commercial fusion reactor is expected before 2050. The ITER project is currently leading the effort to commercialize fusion power. Under 1 percent of the uranium found in nature is the easily fissionable U-235 isotope and as a result most reactor designs require enriched fuel. Enrichment involves increasing the percentage of U-235 and is usually done by means of gaseous diffusion or gas centrifuge. The enriched result is then converted into uranium dioxide powder, which is pressed and fired into pellet form. These pellets are stacked into tubes which are then sealed and called fuel rods. Many of these fuel rods are used in each nuclear reactor. Most BWR and PWR commercial reactors use uranium enriched to about 4% U-235, and some commercial reactors with a high neutron economy do not require the fuel to be enriched at all (that is, they can use natural uranium). According to the International Atomic Energy Agency there are at least 100 research reactors in the world fueled by highly enriched (weapons-grade/90 percent enrichment uranium). Theft risk of this fuel (potentially used in the production of a nuclear weapon) has led to campaigns advocating conversion of this type of reactor to low-enrichment uranium (which poses less threat of proliferation). It should be noted that fissionable U-235 and non-fissionable U-238 are both used in the fission process. U-235 is fissionable by thermal (that is, slow-moving) neutrons. A thermal neutron is one which is moving about the same speed as the atoms around it. Since all atoms vibrate proportionally to their absolute temperature, a thermal neutron has the best opportunity to fission U-235 when it is moving at this same vibrational speed. On the other hand, U-238 is more likely to capture a neutron when the neutron is moving very fast. This U-239 atom will soon decay into plutonium-239, which is another fuel. Pu-239 is a viable fuel and must be accounted for even when a highly enriched uranium fuel is used. Plutonium fissions will dominate the U-235 fissions in some reactors, especially after the initial loading of U-235 is spent. Plutonium is fissionable with both fast and thermal neutrons, which make it ideal for either nuclear reactors or nuclear bombs. At the end of the operating cycle, the fuel in some of the assemblies is "spent" and is discharged and replaced with new (fresh) fuel assemblies, although in practice it is the buildup of reaction poisons in nuclear fuel that determines the lifetime of nuclear fuel in a reactor. Long before all possible fission has taken place, the buildup of long-lived neutron absorbing fission byproducts impedes the chain reaction. The fraction of the reactor's fuel core replaced during refueling is typically one-fourth for a boiling-water reactor and one-third for a pressurized-water reactor. The first artificial nuclear reactor, Chicago Pile-1, was constructed at the University of Chicago by a team led by Enrico Fermi in 1942. It achieved criticality on December 2, 1942 at 3:25 p.m. The reactor support structure was made of wood, which supported a pile of graphite blocks, embedded in which was natural Uranium-oxide "pseudospheres," or "briquettes." Inspiration for such a reactor was provided by the discovery by Lise Meitner, Fritz Strassman and Otto Hahn in 1938 that bombardment of Uranium with neutrons (provided by an Alpha-on-Beryllium fusion reaction, a "neutron howitzer") produced a Barium residue, which they reasoned was created by the fissioning of the Uranium nuclei. Subsequent studies revealed that several neutrons were also released during the fissioning, making available the opportunity for a chain reaction. Shortly after the discovery of fission, Hitler's Germany invaded Poland in 1939, starting World War II in Europe, and all such research became militarily classified. On August 2, 1939, Albert Einstein wrote a letter to President Franklin D. Roosevelt suggesting that the discovery of Uranium's fission could lead to the development of "extremely powerful bombs of a new type," giving impetus to the study of reactors and fission. Soon after the Chicago Pile, the U.S. military developed nuclear reactors for the Manhattan Project starting in 1943. The primary purpose for these reactors was the mass production of plutonium (primarily at the Hanford Site) for nuclear weapons. Fermi and Leo Szilard applied for a patent on reactors on 19 December, 1944. Its issuance was delayed for 10 years because of wartime secrecy. "World's first nuclear power plant" is the claim made by signs at the site of the EBR-I, which is now a museum near Arco, Idaho. This experimental LMFBR operated by the U.S. Atomic Energy Commission produced 0.8 kW in a test on December 20, 1951 and 100 kW (electrical) the following day, having a design output of 200 kW (electrical). Besides the military uses of nuclear reactors, there were political reasons to pursue civilian use of atomic energy. U.S. President Dwight Eisenhower made his famous Atoms for Peace speech to the UN General Assembly on December 8, 1953. 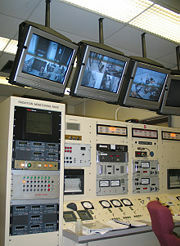 This diplomacy led to the dissemination of reactor technology to U.S. institutions and worldwide. The first nuclear power plant built for civil purposes was the AM-1 Obninsk Nuclear Power Plant, launched on June 27, 1954 in the Soviet Union. It produced around 5 MW (electrical). After World War II, the U.S. military sought other uses for nuclear reactor technology. Research by the Army and the Air Force never came to fruition; however, the U.S. Navy succeeded when they steamed the USS Nautilus on nuclear power January 17, 1955. The first commercial nuclear power station, Calder Hall in Sellafield, England was opened in 1956 with an initial capacity of 50 MW (later 200 MW).. The first portable nuclear reactor "Alco PM-2A" used to generate electrical power (2 MW) for Camp century from 1960 . Such reactors can no longer form on Earth: radioactive decay over this immense time span has reduced the proportion of U-235 in naturally occurring uranium to below the amount required to sustain a chain reaction. ↑ Health Physics Society, Neutrons and gammas from Cf-252. Retrieved October 20, 2008. ↑ U.S. Department of Energy, DOE Fundamentals Handbook: Nuclear Physics and Reactor Theory. Retrieved October 20, 2008. ↑ How Stuff Works, How nuclear power works. Retrieved October 20, 2008. ↑ 4.0 4.1 The Nuclear Tourist, Reactor Protection & Engineered Safety Feature Systems. Retrieved October 20, 2008. ↑ Frank Carré and Gian Luigi Fiorini, Status of the Generation IV Initiative on Future Nuclear Energy Systems, European Nuclear Society. Retrieved October 20, 2008. ↑ U.S. DOE, A Technology Roadmap for Generation IV Neuclear Energy Systems. Retrieved October 20, 2008. ↑ World Nuclear, World Nuclear Association Information Brief -Research Reactors. Retrieved October 20, 2008. ↑ Uranium Information Centre, Advanced Nuclear Power Reactors. Retrieved October 20, 2008. ↑ Charles Till, Nuclear Reaction: Why Do Americans Fear Nuclear Power? Public Broadcasting Service (PBS). Retrieved October 20, 2008. ↑ UIC, Generation IV Nuclear Reactors. Retrieved October 20, 2008. ↑ IAEA, 2006, Improving Security at World's Nuclear Research Reactors: Technical and Other Issues Focus of June Symposium in Norway. Retrieved October 20, 2008. ↑ The First Reactor, U.S. Atomic Energy Commission, Division of Technical Information. ↑ U.S. Patent 2708656 (PDF) issued May 17, 1955-"Neutronic Reactor"
↑ Idaho National Laboratory, Experimental Breeder Reactor 1 factsheet. Retrieved October 20, 2008. ↑ American Nuclear Society Nuclear news, Fifty years ago in December: Atomic reactor EBR-I produced first electricity. Retrieved October 20, 2008. ↑ Helge Kragh, Quantum Generations: A History of Physics in the Twentieth Century (Princeton NJ: Princeton University Press, 1999, ISBN 0691095523), 286. ↑ BBC News, On This Day: 17 October. Retrieved October 20, 2008. ↑ Frank J. Leskovitz,Camp Century, Greenland, Science leads the way. Retrieved October 20, 2008. ↑ Google Video, Video of physics lecture. Google Video. Retrieved October 20, 2008. ↑ Alex P. Meshik, The Workings of an Ancient Nuclear Reactor, Scientific American November, 2005: 82. ↑ OCRWM, Oklo: Natural Nuclear Reactors, Office of Civilian Radioactive Waste Management. Retrieved October 20, 2008. ↑ American Nuclear Society, Oklo's Natural Fission Reactors. Retrieved October 20, 2008. Bodansky, David. 2004. Nuclear Energy: Principles, Practices, and Prospects, 2nd ed. New York, NY: Springer. ISBN 0387207783. Cohen, Bernard L. 1990. The Nuclear Energy Option. New York, NY: Plenum Press. ISBN 9780306435676. Retrieved October 20, 2008. Kennesaw State University. 2005. An entry to nuclear power through an educational discussion of reactors. Nuclear Chemistry—Nuclear Reactors. Retrieved October 20, 2008. Murray, Raymond. 2001. Nuclear Energy: An Introduction to the Concepts, Systems, and Applications of Nuclear Processes, 5th ed. Oxford, UK: Butterworth-Heinemann. ISBN 075067136X. How Nuclear Power Works - Howstuffworks.com. Whyfiles.org - A road paved with pebbles. Annotated bibliography on Nuclear Reactors from the Alsos Digital Library for Nuclear Issues. American Nuclear Society - Glossary of Terms. Nuclear Energy Institute – How it Works: Electric Power Generation. This page was last modified on 14 December 2018, at 15:45.